There will be 3 to 4 time stations in each competition, with 4 time controls each. Park-O will be held immediately after TempO, participants may run a Park-O after completing TempO. The competitions are divided into advanced (A) and beginner (B) classes, entry system has now opened, event details may be read at the official website. The fee of each competition is HK$80 (advanced) / $70 (beginner), $20 discount in total will be given if all 3 competitions are entered at the same time. Please register and come, and don’t forget to register also for SPORTident Y2Y Park-O” stages 5 to 10, and buy a contact-free SIAC control card at a discount price $490 at the same time. IOF held the 3rd “World Orienteering Day” on 23rd to 29th May. HKOC supported for 3 consecutive years, held multiple orienteering events on that day, including “Photo PreO”. Rules of “Photo PreO”: Participants see a photo, with multiple flags (the leftmost is A, next is B, etc. ), and need to answer which flag is the control on the map. There is no Z answer in the game, the control must be placed at a flag. This year’s activity has 25 question, ended at 29th May 2018, 23:59 Hong Kong Time. The organiser has already published the answers and result. 187 people participated this year, decreased by 14% compared to last year. 12 participants got all 25 questions correct, including 1 from Hong Kong. Although the activity has ended, the training questions are still open, interested participants can go for practice. 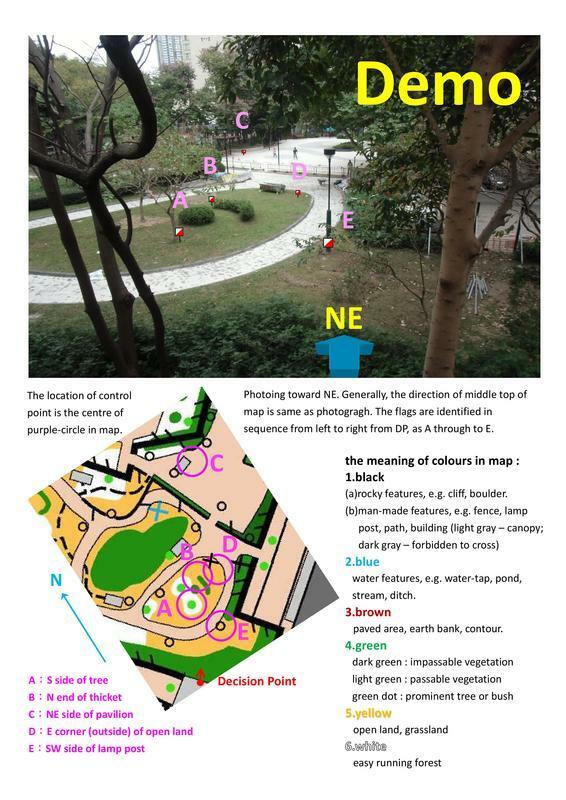 Thank for Mr Akune Li and Hong Kong Orienteering Club for designing “Photo PreO” game.